The plot is based on the early life and studies of veterinary surgeon James Herriot, known for his autobographical books which were the basis for the BBC show All Creatures Great and Small. The idea for the programme came from Herriot’s adventures as a veterinary student. While the plot centres around Herriot, other topics come up like the subjugation of women, the treatment of students by Professor Gunnell – one of the professors at the college, and the rise of the fascist movement in the UK. James Herriot is called to deal with a deadly mystery epidemic on a farm but when he misdiagnoses the problem he realises that he could have wrongly pulled a family apart – but is there anything he can do to make it right? Meanwhile McAloon is presented with an opportunity he cannot refuse and Professor Gunnell gets a shock. James Herriot struggles to balance his politics and his career as a vet after he takes a job at Jenny’s parents’ kennels (Mr and Mrs Muirhead); however, their fascist sympathies soon come to the boil and present a serious problem for both James and Professor Ritchie. Meanwhile Professor Gunnell pushes on to try and get Whirley out of the college and James is left facing a hard choice. I can’t say I’m surprised honestly. It wasn’t very good. There was too much of a feminist argument tacked on and then with the rascist story, its just a bit too much modern politically correct thinking loosely tacked onto a semi biographical setting from the 1930’s and it simply didn’t work. They should have chosen an older more experianced script writer. Siegfried’s character was based on the real life Donald Sinclair. Basil Fawlty was based on a real life Torquay hotelier called – Donald Sinclair. Strange coincidence. Regards, Peter Sinclair (unrelated to either). Just saw the price of the complete ACGAS DVD collection in USD! About 250.-! Crazy! At Amazon Germany you get the 27 DVD-collection (the German dubbed version) for 70 Euro! I am so angry that the young James Harriet has been cancelled , it has only just aired in Australia ,and I found it very refreshing and real television , I could not wait each week to watch it,and now when things are getting really good it’s gone forever, I can’t believe the rubbish on TV daily, and you get a show with real down to earth people, and so gripping , they somehow feel the politics are to much for some people to cope with, I have been watching good and dreadful television for over 60 years, and I am quiet sure this was a very good one, and so do many of my friends, respectfully yours Michael weir. Thank you, ps. Very sad. Sorry to see this program axed and it just goes to show the kind of dunces that makes such decisions. Obviously it’s not ‘All Creatures Great and Small,’ and neither it should have been; I think audiences were expecting a rerun, but the producers didn’t fall into that trap, which appears to have been at the cost of further episodes. The young Herriot comes over as a rather naive young man and thinking back on All Creatures, that’s just what he was after graduating as a vet and for those who haven’t read his book, it tells the same story of a rather naive Scottish vet in Yorkshire where he did battle with local farmers over fees and procedures. Having been brought up in Scotland in the 1950’s, I can only say that I recognize the attitudes and mores portrayed in the show only too well. I think the last episode of the three marked a turning point from where it could have become a very good series, but the guys standing in the corner (wearing the dunces hats) had other ideas. A promising series killed off far to early. Another Aussie who just got hooked on the Young James Herriot series, only to find it had been cancelled. I am very disappointed, as I feel it was just beginning to go somewhere. I grew up watching All Creatures Great and Small and have many James Herriot books on my bookshelf. I was enjoying delving into the student years, and as someone who has just finished Med School, was especially enjoying the look into the Vet Student past, as I think we forget just how young a profession vet science is, and jut how different it is now. The multi-layered story lines, of poverty vs wealth, sexism, the political history of the time, and a few love intrigues thrown in for good measure, were teaming up to make this a very watchable series. Very disappointed in you BBC, very disappointed indeed! I recently bought the DVD The Young James Herriot. To be honest, my husband and I enjoyed the three episodes. We were disappointed to learn that there were only three episodes. Will the material upon which it was based be turned into an early biography of Herriot in Vet school days? The vet school, while having parts that are similar to an actual vet practice, the story is sufficiently different and of a period that is historically of interest, it would be worth having the series (complete years of vet school) at least in book form or even as a DVD series without viewing on TV…you know, a made for DVD series. 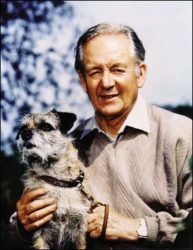 I am a huge fan of the James Herriot stories, movies and of course the television series All Creatures Great and Small!! I just watched this series for the first time today – purchased it on EBAY – and was very pleasantly surprised. I enjoyed it very much!!! I wish they would renew the series and continue to film many more episodes!!!!!!!!!!!!!!! Really- are we surprised that this farce was pulled? It is so typical of the BBC to try and sanitize history with a vile political agenda. Contrary to their belief, some of us, just like in the original, just get on and live our lives rather than try to brainwash the masses. A fitting end to a verminous little production!! Come on BBC- don’t insult our intelligence again with another crude and vile re-hash. I am so sorry to hear that young james herriot will not be continued. This was such a well-done production and seemed destined to continue at least through his years at college. I would love to have seen how he matured, not only as a vet but also as a person. I would have loved to see how veterinary science progressed. I loved that they showed the historical environment of the time so honestly. I’m sure herriot’s awakening to the reality of the world must have influenced him hugely. These same issues are taken on in the current version of upstairs/downstairs as well and i believe it is essential to keep these historical contexts front and center as they are always pertinent. Previous PostPrevious Happy Birthday, James Herriot!